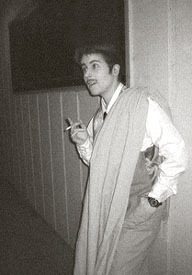 Haxton In Hollywood: Toga! Toga! "I love togas. I can't repeat enough...there's nothing more sensual than a linen or light woolen toga." "When Harold would get 'three sheets to the wind', he'd usually end up wearing one of sheets". Throughout his life, Harold Haxton had a secret (well, maybe not-so-secret) affinity for the Roman toga. "It didn't really bother me...I mean, as fetishes go, you gotta admit that's a pretty mild one. But it did bother me when he'd ask me to iron them. Togas are around fifteen feet long and can have an awful lot of pleats."